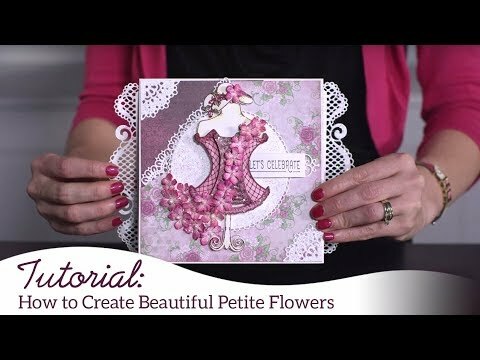 Instructions: Take the 12 x 12" Bordeaux Cardstock for the background, now take the white cardstock and cut it at 11 1/2 x 11 1/2" and take your scissor and distress the edges, take a paper from the paper collection and cut this at 11 x 11". Glue them all on top of each other. Take a stencil and your Modeling paste and put some on the right upper corner and the left bottom corner and let it dry. Then take the Glimmermist and spray it over the place where you put the modeling paste and let it dry very good. Take a sheet of paper from the collection with the 6 x 6" squares on it and cut a frame from one of them. Tape this over your photo and place it on your sheet, take another piece of a photo and place this with foam tape on a green paper (mat), cut it out and place it on the top right corner. Tulips: Stamp with the Tulip stamp and vermillion ink some tulips on white cardstock. Color them with Monarch Orange on the bottom and Sunflower on the top so that it blends in very well. Color them on the back too. Cut the flowers with the coordinating die. 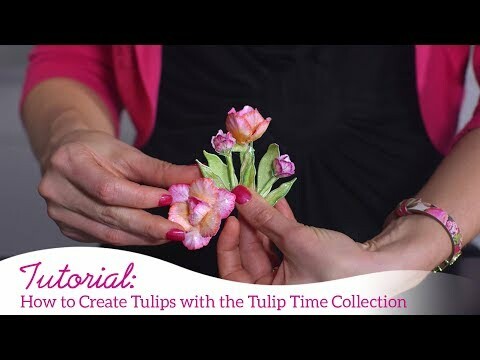 Now stamp the tulip leaves with Fern Green and color them with Leaf Green. Cut them with the coordinating die, now place all the flower cutouts in the 3D mold, spray them lightly with water, put the lid on and run it through the machine. Glue 2 flowers offset on top of each other, make a hole in the center and pull 3 stamens through it, take your flower tape and run it over the wire of the stamens. Cut the little round end of off the leaves, Glue the leaves on the stamens, roll the base and glue this on the stamen under the flowers. Stamp with fern Green some tiny backyard flowers on white cardstock and color the leaves with Leaf Green and the flowers with vermillion, put some dots on the flowers with the dandelion yellow Nuvo drops, let this dry. 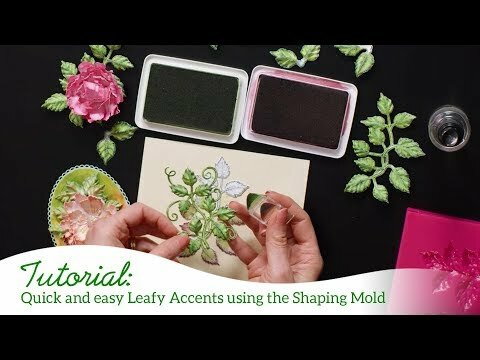 Stamp with the Leafy Accents set and Coffee Ink on white cardstock and color them with the leaf Green and some shadows with Fern Green and Monarch Orange. Cut them out with the coordinating die and place in the 3D mold, spray them lightly with water and run it through the machine. Stamp the small flowers from the Floral Fashionista using Manganese Ink on white cardstock, color them with French Ultramarine and cut them out with the coordinating die, place them in the 3D mold and shape them then place a yellow dot of the Nuvo drops in them and let them dry. Stamp with fern Green some Tulip Vase Fillers and color them with Leaf Green. Cut them out with the coordinating dies. On the tiny Hyacinths you can glue some Prills and let this dry. Stamp the small and large peony with Coffee and color them with Buttercup and Sunflower Ink, cut them out with the coordinating die and shape the petals on the Deluxe Shaping mat. Now glue the flower together, make a hole in the center and pull the stamens through. Now Glue 3 tulips on the left bottom corner of the photo and place some Backyard flowers on it too, then you can put the photo on foam tape and place this over the bottom part of the tulips, now dab some glue next to the photo and cover it with Prills. For the right side of the photo, place 4 tulips and some backyard blossoms, then glue some of the Spanish moss on it. Place the bow on top of that. Than place the leafy Accents and on top of that the Peony then the little Hyacinths. Under that and on top of them add some of those tiny Blue Flowers and some Green fillers, take the Black fine liner and make some doodles all around the layout on the White cardstock.